Rob and Becky gave us this recipe, back in Jane's ANU, Todd Street, O'Connor days. Rob also introduced us to artichokes, dinner parties staged on a house door liberated by its hinge pin, and many other things (Peter). 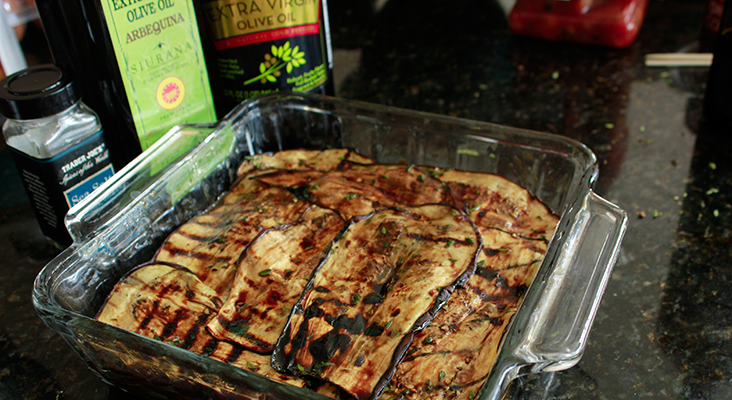 Once made, balsamic eggplant will keep for months in the fridge. Perfect for sandwiches, hamburgers, pizza toppings and for tapas. Eggplants grow well in SoCal's long, hot summers. 1. Heat up barbeque or grill. 2. 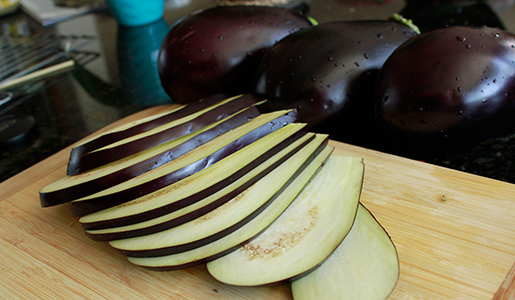 Rinse eggplants and cut carefully into neat 1/4" slices. 3. Place on barbeque or grill and brown up. They will also thin down. Don't worry if you have burnt bits. 4. Let eggplant slices cool, maybe on a cake cooler. 5. Strip thyme from stalks, chop further if needed. Add to mixing bowl. 6. Crush garlic, add to bowl, with salt. 7. Add olive oil and balsamic vinegar and whisk. 8. Drag the eggplant through the mixture and place in a sealable Pyrex dish. This should be the dish that you will later store in the fridge. 9. 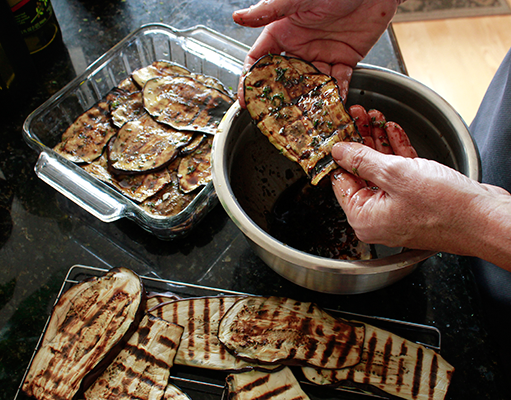 Arrange eggplant slices compactly - and gently tamp down from time to time. Avoid air pockets. 10. Pour remainder of mixture into Pyrex dish, seal and refrigerate. Wait a day or two, then eat. 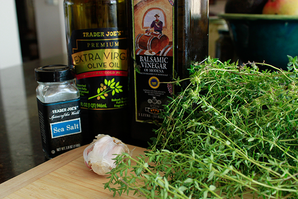 This recipe is a great use of thyme, if you have it fresh.